ZipWall® is an award-winning barrier system. It has been honored by the press and hailed by builders, painters, carpenters, floor refinishers, demolition workers, restoration companies,do-it-yourselfers and now used by the FIRE/RESCUE and LAW ENFORCEMENT INDUSTRY. It is as a simple and effective method of controlling dust by isolating the worksite from other areas. The patented ZipWall® spring loaded barrier system consists of telescoping twist lock ZipWall® poles available in both twelve and twenty foot lengths. 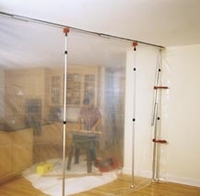 The system locks the screening material (ordinary plastic sheeting, light canvas tarp or drop cloth) firmly against the ceiling, creating a "virtually airtight" barrier. Once in place, just lift and tuck the screening material under the pole to create a tight barrier from top to bottom.